Star Trek came back for a few repairs over the weekend. I worked on this game four years ago and made a little post about it back then. It had a problems that developed recently. Such as the top saucer was stuck and the game wouldn’t boot up completely. I found a fuse blown for the solenoid bus that also affects the MPU booting. Once that was replaced, the top saucer was still intermittent and a the pop bumper switch was activating one of the sling shots. Every switch has a capacitor that can cause issues over time. The best fix is to just cut them off and erratic problems are fixed. The top saucer repair was more in-depth. I replaced it’s controlling TIP102 transistor since it tested out of specifications. I replaced a connector and header pin (actually all of them for good measure) on the driver board, plus the solenoid’s diode. It all appeared fixed after testing it 100 times. I rechecked the game after a few hours and the problem was back. I traced it back to the controlling IC that was causing erratic behavior. The solenoid wasn’t always getting the signal to activate. Once the IC was replaced, the problem was fixed. After that, I replaced all the burned out bulbs and the game was ready for play. And, ready for pick up. 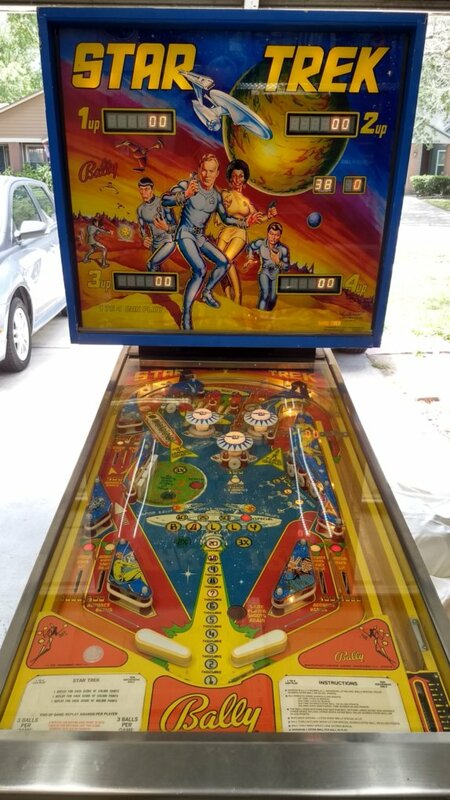 This entry was posted in Repairs, Mods & Shop Outs and tagged bally, florida, Pinball, repair, Star Trek, tampa by Pinball Shark. Bookmark the permalink.